We specialise in the production of potatoes. The mild climate coupled with our soil makes the regions of Angus and Easter Ross some of the best areas for potato production in Scotland. We grow main crop and salad varieties but have focused on salad varieties recently, namely Maris Peer, Charlotte and Vivaldi. The potatoes are planted in late March and April and harvested in August and September. Close monitoring of the potatoes happens at all stages of their growth but when we feel they are the correct size the green foliage is chopped and the potatoes are harvested 4-5 weeks later. Every year we look at the varieties we grow to try and match what we think the market will be looking for. These can include the more traditional varieties of Osprey, Maris Piper and Desiree amongst others. 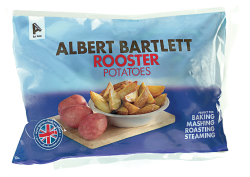 We also grow Rooster and Apache, two varieties marketed by Albert Bartlett, a family run business for over 60 years and the UK's leading grower and supplier of potatoes. Please follow links below for more information about these varieties. All of our ware potatoes are marketed through Albert Bartlett and in turn will end up in most of the major multiples in the UK.